“The messaging and checklist features have streamlined communications for our staff, and it will help our managers more efficiently oversee their teams." 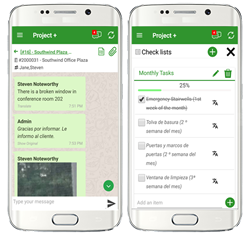 Timesheet Mobile, the leading provider of GPS-enabled time tracking and scheduling solutions, has launched Timesheet Mobile Project+, a comprehensive project management, messaging and task management feature. Project+ will be integrated into Timesheet Mobile’s existing application, providing businesses with an all-in-one resource to communicate, collaborate and manage their workforce. Available now to businesses around the globe, employees can log into Project+ on any mobile device to review key projects and activities in real-time, as well as receive prompts to punch in and out of work shifts thanks to Timesheet Mobile’s sophisticated geofencing technology. For managers and business owners, the availability of Project+ gives companies a central repository to delegate tasks, communicate instantly with employees, and review and approve employee timesheets and schedules. Project+ has already delivered tangible benefits for businesses with a significant mobile workforce, in industries as diverse as construction, healthcare and transportation. Simple Checklists and Task Management – For businesses working across multiple clients or projects, checklists can be set up for teams to access, to ensure that all activity is completed on time. With one click, employees can easily check off items as they are completed, sending push notifications to everyone on the team. Direct Message and Team Messaging – Teams can discuss urgent priorities, upload images from jobsites, attach PDF documents and clarify updates from the office. Businesses can create message groups based on people working together on particular projects, while employees can also directly message co-workers or managers on the app. Image Attachments – Employees can take a photo on their mobile devices and upload it directly into Project+ team messaging. This is particularly useful for workers at a job site who can instantly share an image from the project with other teammates to facilitate swifter and clearer communication. Complete Project Visibility – Employees can search message threads and favorite specific projects on the app. With a few taps on the mobile device, users can access all associated messages, checklists, images and information pertaining to current client jobs. Multilingual Translations – Project+ messages and checklists are translated instantly in English, French, German and Spanish, ensuring swift communication for employees. Timesheet Mobile is the leader in GPS-enabled time tracking, scheduling and project management software. Using Timesheet Mobile’s Punch Prompt™ geofencing technology, businesses can create a “virtual boundary” to make it even easier for a worker to accurately punch in and out of a job site. Whether it’s an employee tracking tasks or hours, a manager overseeing a workgroup, an administrator processing payroll or a business owner assessing their overall costs, Timesheet Mobile unifies and connects companies with their workforce. Timesheet Mobile is used by thousands of businesses in 13 countries worldwide. Learn more at http://www.timesheetmobile.com.